Blurb: Travel journo Kairavi Krishna (Kay) has had it with men. After a series of disasters she is all too tempted to walk out on the prospect of ever finding love. Accompanied by her best friend and flat mate she sets off to Goa, hoping to get away from her miserable love life and vowing to stay clear from male species. Goa, however has host of surprises in store for her, especially on the new year’s eve and since then. What happens when she meets the charming Dr. Vivian D’Mello and when her ex turns up around her is to be found. 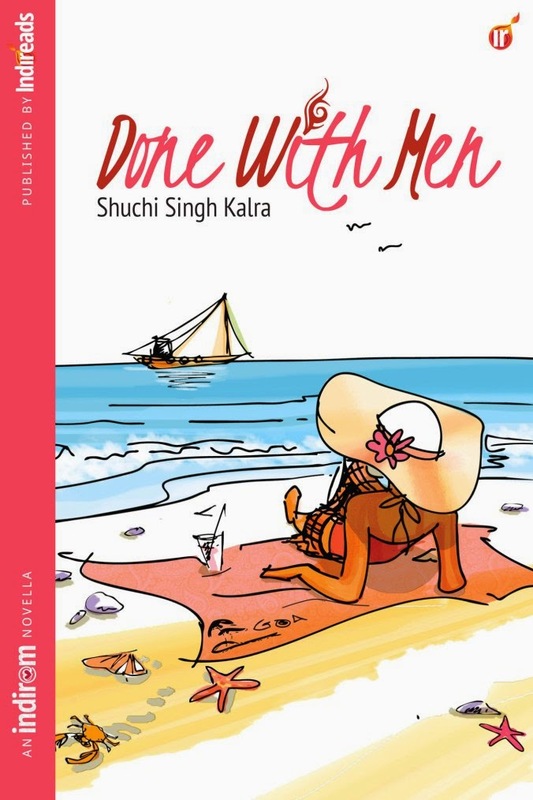 Review: There are some book covers which make you feel ‘I want to read this book’ and ‘Done With Men’ is one such book for me. And when you have a very interesting story line it is all the more worth a read. Done With Men is a light, zippy and a delightful read with a tinge of humor which made me chuckle every now and then. One almost feels as if you are the main character and go through all the whirlwind of emotions that Kay goes through. The author has held together the plot with a simple and feel good yet somewhat realistic story which every person at some particular point in his life go through. It is a quirky tale of an easy going character who lambasts men in a funny way after a disastrous relationships with them and probably who is jinxed in love life. It is a perfect Sunday afternoon read. The narration is witty with tongue-in-cheek dialogues ensure that there is no dull moment in this mushy and rom-com novella. One can easily relate to the ‘Thought Bubble’ that has been categorically mentioned and can also be described as one of the characters in the book, if I may say so. The characters are beautifully etched especially the two central characters of Kay & Dr. Vivian. The striking chemistry between Kay and her BFF Baani who are poles apart in almost everything is something that makes the story all the more interesting to read. Overall: Done With Men is a perfect light read on a breezy Sunday afternoon which will keep you hooked from the word go. I have received this book as a part of the Indireads Book Review Programme.